Library Week wrap part 1 - Were you at the Willow Pattern Story Author talk and Morning tea last Monday at Engadine Library? I’ve always been interested in the concept of learning. Observing an audience being entertained and informed is intriguing. Their individual reactions, body language and response to the speaker are all different. Last Monday Engadine Library provided me with an opportunity to be part of this learning process. 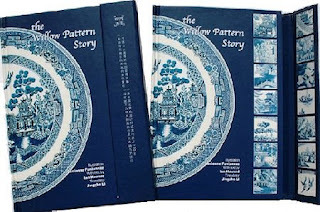 The legend of the Willow Pattern story has existed for a very long time. I was told a vague interpretation of it as small child and subsequently have never forgotten it. The author talk hosted by Engadine Library to celebrate Library & Information Week allowed me to learn even more about this classic tale of young love, greed and revenge. Translator Jingzhe Li has collaborated with Illustrator Lucienne Fontannaz to produce the Willow Pattern Story. Jingzhe entertained and entranced her audience with her gentle storytelling. It was obvious by their comments that most of the audience already knew some facts about the legend but after 45 mins we knew a great deal more. However, during the morning something special happened. A common thread was woven throughout the audience. A 100 year old embroidered tablecloth or a tea set handed down through generations with the distinctive blue and white Willow pattern design connected people as they chatted about their own stories as memories were evoked and shared.